Online savings bank RaboDirect Ireland has said it will cease its operations here and close on 16 May. The move will result in 31 compulsory redundancies. RaboDirect Ireland, which was set up here in 2005, has more than 90,000 customers in Ireland with over €3 billion on deposit. It is based in Dublin's IFSC. In a statement, the bank said it would waive the notice period on its saver accounts and will pay the interest earned up to the point of account closure. "In the case of term deposit accounts, we are paying all the interest that would have been due on the deposits over the full term," it added. 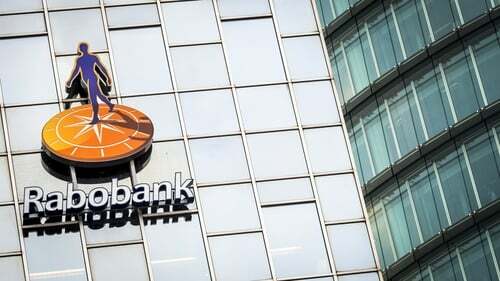 Rabobank said it continues to be committed to its corporate banking activities in Ireland, which focuses on food and agri clients. These clients will not be affected by the withdrawal of RaboDirect from the Irish market, it added. The online bank said that as it exits the Irish market, it will make it as straightforward as possible for its customers to close their accounts and transfer their savings securely to another financial institution. It said it has started to contact each customer directly with the actions they need to take before 16 May. Head of communications at comparison website Bonkers.ie, Mark Whelan, said that RaboDirect's departure from the Irish market is another blow to Irish savers. "The bank's 90,000 customers will have difficulty finding a traditional savings account that offers good value in this historically-low savings rate environment. Right now, the reward for putting €10,000 away for a full year with most banks wouldn't even yield a €20 return after tax," Mr Whelan pointed out. He said that RaboDirect customers who would like to keep their money on deposit with a traditional financial institution should shop around to find one of the few remaining accounts that represent decent value.